← A step closer in culturing “unculturable” bacteria? I found “The Wall street Journal. Guide to Information Design” in a bookshop and thought to give it a go. 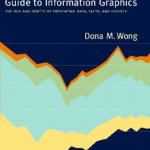 It is written by Dona M. Wong, an old student of Edward Tufte. The books aim is to be a “reference to be put on ones desk”, the question is who should put it on his/her desk and who not? Distributed over five chapters to book maintains a very basic level of graphic design. Chapter two has a nice outline showing Do’s on the right page and Don’ts on the left page, and contains a lot of useful tips (ie. try to avoid a legend in a line graph, but just label the lines on the right side of the line) but the book rarely explains the theory behind the advice. For this, one has to grab back to Tuftes “The Visual Display of Quantitative Information”. Another point of critique is the sole focus on financial data, I guess that comes mainly because of the part “The Wall Street Journal” in the title, but it neglects a lot of other areas. The book would perform better if it zoomed out and took a leap with the rich data out here. The pixel/word ratio is very high and this can be a big plus for some readers and a big minus for others, personally I enjoy a piece that is richly illustrated with examples, and that is definitely the case here. However the downside is, as noted before, it cuts on explaining the theory behind the concept. All in all, if one is starting to work as a financial journalist this book is definitely a must read. If you are a novice with graphs in general this books contains a bunch of valuable tips, but otherwise there are better books out there with a higher educational value.